Forget bibs, hammers, and extra napkins. This recipe for crab legs is clean, neat, and easy to eat—the ultimate dinner. Once it's prepped, crab cooks quickly, and so does the orzetto. To get this meal on the table in the shortest amount of time, prep the crab, cook the orzo, then proceed with the rest of the instructions. For the crab, heat oil and 1 Tbsp. butter in a large sauté pan over medium. Add sliced garlic and shallots and cook until softened, about 2 minutes. Add crab legs, wine, pepper flakes, lemon wedges, and bay leaf. Increase heat to high, cover, and simmer 5 minutes, stirring after 2 minutes. With a slotted spoon, transfer crab, lemon wedges, and bay leaf to a bowl; cover and keep warm. Reserve liquid in the pan. For the beurre blanc, simmer reserved liquid until reduced to 3–4 Tbsp. Reduce heat to low and slowly whisk in 7 Tbsp. butter, a few cubes at a time until melted. Off heat, add 1⁄4 cup cream, parsley, and chives; season with salt and lemon juice. Set beurre blanc aside while finishing orzetto. For the orzetto, cook orzo according to package directions; drain. Cook minced garlic in 2 Tbsp. butter in a saucepan over medium-high heat, about 1 minute. Add greens and corn; cook 3 minutes, stirring frequently. Stir in cooked orzo, 2⁄3 cup cream, Parmesan, and 2 tsp. lemon juice; season with black pepper. Simmer orzetto until heated through, 1–2 minutes, stirring occasionally. Thin orzetto with a few Tbsp. hot water, if too thick. 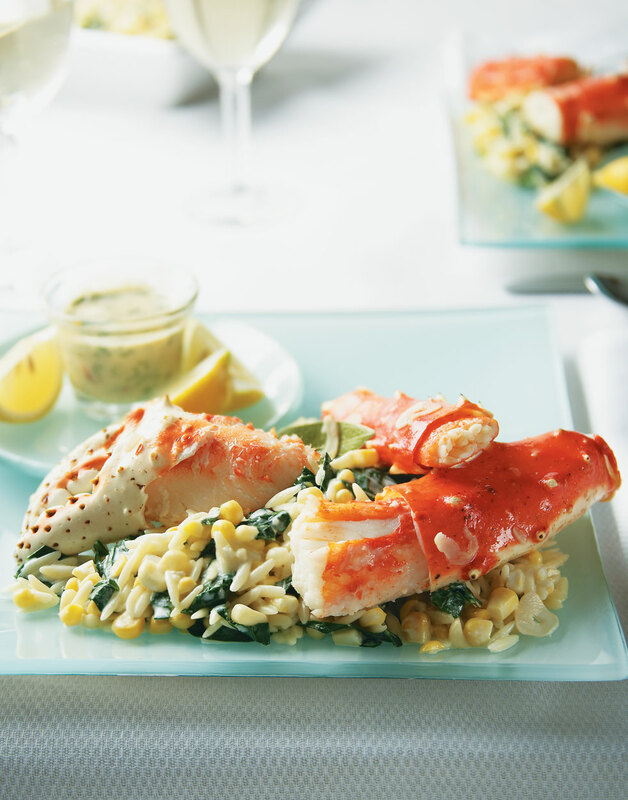 Serve orzetto with crab legs and beurre blanc for dipping. Use a slotted spoon to remove the crab, lemon wedges, and bay leaf from the pan, leaving all the flavorful juices behind. Stir the juices occasionally while they simmer so the garlic and shallots don't scorch. So it doesn't curdle, add the heavy cream off heat along with the herbs, then season the sauce to taste.